I started this blog early 2010, originally with blogging network Orble, but in May, I swapped to blogger. Why did I start this blog? I wanted to start documenting to the blog reading public ways in which fashion can be sustainable. 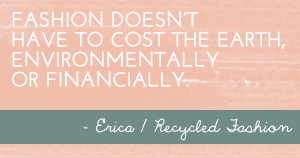 Recycled fashion is sustainable, and lots of fun! My passion for fashion, recycling and protecting the environment stems back many years. I have always believed buying new manufactured clothing and products can be reduced when there is an abundance of good quality second hand threads available to buy through charitable shops, markets and online sources. I have soon discovered recycled fashion covers so much more than just second hand clothing. Garments can be reworked into something better, refashioning and upcycling is on the up. We can repurpose almost anything into fashion accessories; plastic bottles to bracelets, chip packets to handbags, magazines to necklaces, old tyres to wallets and so on. Blog land has inspired me to learn sewing! Not only can learning to sew create 'new' and unique fashion garments, sewing can be done in an environmentally friendly way by utilising fabrics already in circulation. "Sewing is more than a crafty skill. It’s a movement. A way to say ’screw you’ to businesses that care more about profit than individuals. A thumbs down to the social and environmental damage that happens when things are made so carelessly. It’s a rebellion against the clever marketing that makes us think we need more than we do. Sewing says ‘I choose a kinder way to get the things I need'." Blog land is introducing me to handmade, ethical, eco friendly, and sustainable living, not just in fashion, but in everything I do. I have in my hands some ethical greeting cards, and fish print from iamfish. Cards printed in Australia, on 100% post consumer recycled paper, and using soy ink, green power and waterless printing. You can't get more sustainable than that?! iamfish introduced me to the ecofriendly bamboo toothbrush, something I'd never heard of before I started this blog. 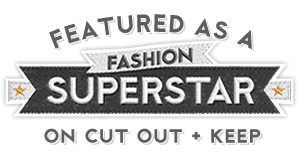 I am very pleased to have recently received two blog awards for Recycled Fashion. This makes me very happy! The first blog award for '50 Fabulous Blogs For Green Fashionistas' by Graphic Design Degrees, and another award which is being compiled for an entry into the 'top 100 green blogs for students'. Link to follow once complete. Blogging gives us little voices in the big wide world, not everyone can hear our voices, but for those that 'listen' carefully enough, you'd be amazed at what you might find. It was really great to read about you and your ethics. I'm looking forward to visiting again and again!